102_store has no other items for sale. Type: Shoe Mount Width: 2.99in. While lens are important, I feel lighting is more critical. You must always be ready for any lighting condition. So, I chose buying this flash unit. Definately a smart choice. I considered buying off-brand units to save money, but after reviewing the specs I new this one would meet my demands and be 100% compatible. Specifically on the manual settings and recharge times. Mechanically it's well built. It has a sliding shoe lock rather than a threaded dial to tightening. A push release allows for controlled angle movement of the flash rather than force click. A diffuser and white card is also integrated in the flash and easy to pull in and out. The auto and manual settings are very similar to previous speedlite models. But one nice feature is the wireless link when using other speedlites as slave flashes. This feature works great because it doesn't depend off the bounced light to trigger the flash, the 580 sends a signal to the slave flash. I've used light triggered slave units and they don't work well if the light doesn't directly hit the sensor. 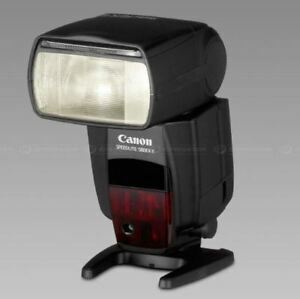 Im a Professional Photog, and this is Canon's Best Flash. I bought this as my main flash with my 5D, and use 2 other Canon Speedlites to get a traditional 3 point lighting that everyone likes for indoor portraits. Very easy to set that up with all canon items, using the Master/slave settings on all the flashes... I also do have a constant lighting rig that I use as well, but on location, I prefer flash, as it's easier to deal with. But, even as a single flash, on camera, it's great for general flash with any and all EFS lenses, since in E-TTL mode (stands for Electronic Through the Lens) - the flash will actually ZOOM to set for correct spread no matter what lens you have... that is a great feature for things like doing a larger group shot, or a longer lens outdoors, and you want to set in on fill flash... Speaking of fill - again, it shines wonderful there... most flashes will only let you sync to about 1/250th - but what happens if you want to shoot 1.8 or 1.4 and there is too much light outdoors, even at ASA 100? but you still want to use fill flash to balance the foreground of the shot - Easy - set the flash to H mode, which is it's High shutter speed sync... This allows you to shoot above 1/250, to properly expose the shot, and then give you those nice catch lights in the eyes, if the subject is positioned say, under a shady tree. Conclusion - if you shoot Canon, and are considering the 430 or the 580 - get the 580 FIRST... and you can always get 430's to slave later, but the 580 is the pro standard for Canon DSLR.... Period. - Yes, they are a little pricey, but you get what you paid for - you should look at this as part of must have gear if you want to create consistent Professional results in your photos - so STOP buying lenses, and buy this first :-) Very easy to use for a beginner - but a flash you can grow into with all it's nice manual settings too... Head will pan and tilt in any direction, and I really like the built in white card for light fill, or full bounce indoors... I also really love the built in difusser for wide angle shots too... get this flash, you won't regret it! The main part of the photographic equipment is light, because light creates still images. No light - no photos simply as that. This flashgun is one of the most powerful and reasonable upgrades you can make for your DSLR system. 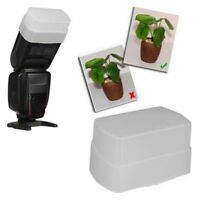 It does its job excellent - it creates a lot of high quality, reference light, needed for best results in most conditions when the light you have for the object is not enough to make clear, properly exposed, highly detailed photo. Having smudged, low detail and pixmap photos? And blury moving objects or blury portraits indoors? Thinking that something wrong with the DSLR body? If you have one of those common problems then trust me - it's not your lens blur and low detail in most cases and not your low resolution CMOS or CCD sensor having (you think) not enough megapixels to reproduce the details you want - it's simply lack of light for your camera sensor! Believe me, as I'm a person who passed through all the problems above in my wedding and everyday photography. But as I was only starter at the time I couldn't know that the light is so important for digital SLRs. Get this flashgun and all the bad photos will be left alone in the past. Why 580EX and not EX mark II? Well, I'm tight on budjet right now as I have my own family and I need money for a lot of things not only photo equipment. If we look at the differences between the two speedlites we can figure out three major improvements: 1) mark II weather proof 2) mark II metal mount with a locking mechanism instead of plastic screw 3) mark II has dedicated external metering sensor This is the cons of the 580ex and the strenths of mark II. BUT the difference in price is great now when looking through ebay auctions and you can save up to $150 sacrificing these improvements which for someone like me are not so important and quite disputable because of 3 things: 1) you can always use nylon camera cover or special camera raincoat - it's better protection 2) you can always be accurate with hot shoe mount not to damage the plastic one 3) you can rely on your DSLR metering sensor in most cases when you use the flashgun on your DSLR body. For me there is only one major drawback - it's really heavy device, 0,7kg and even more with four batteries, and the center of gravity moves upper when you get the flashgun on DSLR's shoe, camera can easily fall down if it's on unstable surface. But it's ok when you get used to. There are three different modes like full auto E-TTL with no adjustments needed, Manual, and Stroboscopic mode. The auto E-TTL works like a charm when you are in the begining of flash photography. Manual mode is rather complex and needs some knowledge. And stroboscopic mode great for fast moving objects. The controls remind of controls used on my Canon EOS 20D body, with JOG Dial ring and the select button in the center. The tilt head moves in all directions. The flashgun is very powerful and recycles fast! We this flashgun I can be sure without previewing my shots that I have all of the pictures properly exposed, highly detailed and just the way I need them. It's the best possible upgrade for the DSLR system either for beginer or advanced photographer. I highly recommend going with the flashgun if you want full freedom when you are doing photography. I think the 580ex is the best choice for its price tag and when you will need more features of 580ex mark II you can always get it as a second unit to do wireless flash photography. As everyone probably already knows, the 580EX II is an excellent flagship flash for Canon before the 600EX-RT. I've used this together with other 580 EX II (and the original, which doesn't support ETTL-II) and 480EX II flashes and these guys are just great. I'm sure other reviewers and online reviews have already stated pretty much everything about these, so I'll try to add things that might not be too obvious. 1) In a multi flash setup, it can get annoying since for the wireless set to work the front red/infrared section of all the slave flashes must be in line of sight with the main master flash. Bouncing off walls in a small room might work just fine, but for outdoor shoots, you'll need to adjust/swivel the base to face the master. This can be difficult with flashes inside umbrellas/softboxes. 2) the 600EX-RT is now out and the "true" frequency based wireless system works wonders over the older system (among other upgrades in the 600EX too). The 580EX II of course can not be used even as a slave with the new RF wireless system. 3) these guys are slowly dropping in price, which is great, but if you're an enthusiast and do not need 100% reliability or simply looking for more slaves, you might consider third party flashes that support the full set of features found in the 580 EX II (that includes ETTL-II and the older wireless flash system). The YONGNUO YN560 IV for example even looks like the Canon. 4) with lots of tilts, a lot of these 580EXs tend to have broken wires near where the joint is. Just check online to see how to fix these if you're into DIY. (the hotshoe is also easily replaced if it breaks, with parts available right here on the bay) 5) there are lots of cheap third party power packs/external battery packs for flashes available. But a note that with the cheaper, more common generics, they easily overheat with normal use and die. We've gone through probably 4-5 of these in this manner with some even failing on the first event shoot. The nicer third parties do just fine though (and still cheaper than OEM). The current one that's lasting quite a while for me is the Pixel TD-381 (not sure if there are other rebrands of it). Anyway, great flash!